EVOC are specialists in the field of bicycle transport, and the voc 280L Bike Travel Bag is a case in point, with many great features only gained through experience. Packing up and then lugging a bike around an airport is the part of going away with a bike everyone dreads. Anything that can improve the situation is worth a look in my eyes. When buying a bike bag, you'll notice there are two types: soft shell and hard shell (well, and a few hybrids too). The EVOC is the former, able to fold down to the length of its rigid base (1300mm), making it perfect for stowing neatly under a bed when not in use. A soft shell also means it is relatively light. Coming in at 8.6kg, it saves around 3kg over most rigid plastic boxes. The argument for whether soft or hard shell provides better protection is polarized: a hard shell may be more protected from hard outer knocks, but the bike is able to knock against the inside if not cushioned well. The EVOC is fairly well padded inside, with space along each side to stuff some lycra to help cushion any blows. Often the problem with soft bags is that their lack of structure makes loading difficult and moving the bag around a bit like trying to get a drunk friend home. 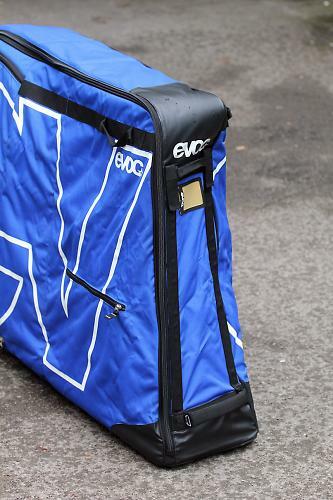 EVOC have developed structural rods, which slot in front, at rear and in wheel pockets, and act like bones, allowing the bag to maintain shape without a bike inside. You could argue the EVOC is a hybrid bag because of these but either way, they work to great effect. A simple feature but one of the bag's best. Packing the bag is extremely easy and quick but still results in one of the most securely packed bike bags that I've used. You start by inserting the structural rods. Next, the handlebars must be removed from the stem - the only dismantling of the bike required. A frame pad then wraps around the top-tube/down-tube joint - this has velcro straps, which the removed handlebars attach to. Our test included the optional road fork protection; this pads out the forks so that they are more secure in the included fork strapping (the strapping is designed to take larger mountain bike forks). You would be fine without, but it just helps to hold the bike better. 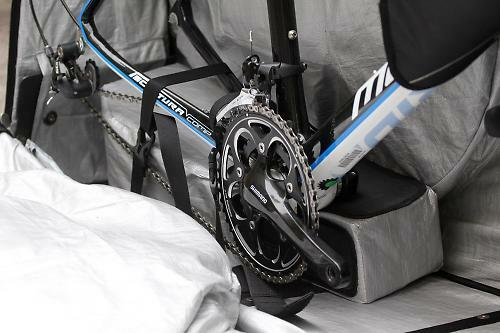 A large foam block sits between the chainstays, with a groove for the bottom bracket to sit. The block can to moved to sort of wedge the frame in place. Along with two straps at the chainstay, seat-tube, steerer and the fork, the bike is certainly battened down. All that is left is to pack the wheels with their skewers removed (and discs if you have them). 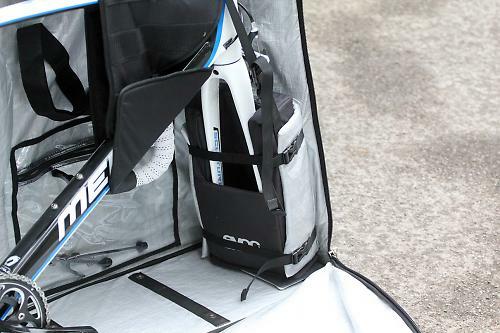 Wheels are stowed in side pockets on each side of the bag, rather than in the main compartment. This helps to avoid damage to your frame because of an ill placed cassette and also, they provide an element of side protection. You might think the wheels are exposed this way but the axles are going to be the impact point, with extra 'PE Board' cushioning featured at these points. The bike placement isn't by chance, EVOC have designed it such that the areas of the bike naturally designed to take stress are where any impacts will occur. Three additional pockets are included: a clear A4 size and A5 size inside, then an outer A4 size side pocket. These are useful for the pedals and skewers that you've removed but also a few tools, gels, etc. As with all the zips on the bag, these are high quality jobs which inspire confidence. Outer zips are large double zippers, which have loops for padlocks. In all, it took me under 10 minutes to pack/unpack (it's the same process in reverse) the bike, once I'd followed the instructions. That is rapid compared with my other bike packing experiences: removing the mech, working out how to safely strap it to the frame, searching round for bubble wrap and pipe insulation, sticking the bike in, realising it doesn't fit, juggling it around...repeat. Part of what makes it a joy is that the bag's zip goes around the whole upper circumference, allowing full side access - equally for the wheel pockets. Along with the structural rods, rear wheels sober up that drunk friend of a bike bag. If you've ever tried to get a bike bag onto an airport trolley, you'll know what a great feature this is. They are smooth and roll very well, thanks to 110mm wheels with sealed bearings. Most of the weight is at the rear, making the bag well balanced for lifting with front handle when wheelieing too. In all there are 8 handles, making it easy to pick up from all angles (think luggage carousels). I've been extremely impressed by the EVOC Travel Bag. Having taken bikes abroad a number of times I've always resented the transportation stage to the point where it puts me off flying. The bag caters equally well for mountain bikes, all the way up to 29ers. 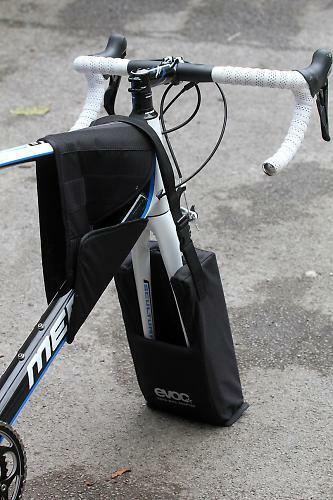 The bag retails for £299 (+£18.99 for our fork block). 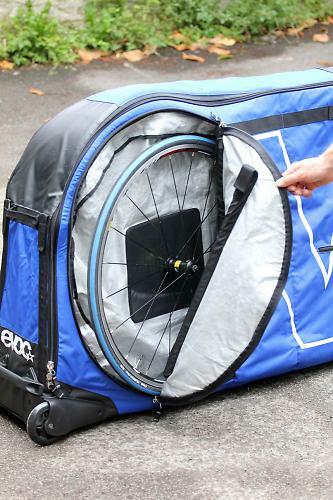 That is on the premium side of bike bags but it is full of premium features. You pays your money, you takes your choice; sure you can transport a bike in a far simpler bag - even grab a bike box from your LSB - but the EVOC is going to make the whole affair much more pleasant; the EVOC is as good as it looks. 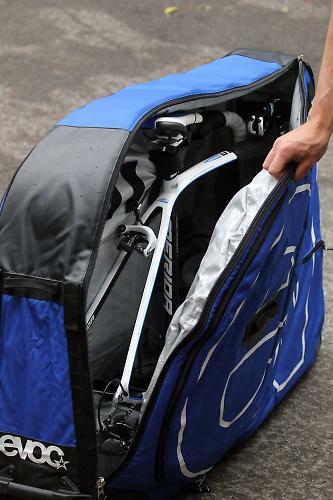 Great design makes short work of the usual bike travel woes - a truly stellar bike bag. I'd agree with that, the bag's small footprint means it will fit in many cars. I think this is aimed at those who care for their bikes and who are likely to use the bag more than a few times. A full 10, I really can't fault it. Nothing has been scrimped on in terms of material and design. Packed up in under 10mins for starters. Unfortunately, I don't know any luggage handlers so couldn't ask them to do their worst on it but with how well the bike is packed I'm confident my bike is safe. Good solid zips don't feel like they're going to fail you when half way across the world. Coated tarpaulin and nylon make for a tough outer shell. The base has plastic skid plates to stop corners becoming holes (I've been there with my current bike bag). Weighing in at 8.6kg, it is competitive for soft shell bike bags and I work it out to save around 3kg on hard shells - precious luggage allowance. It is quite a bit more than other soft bike bags (~£100) but I think the solid design features make up for this. Very well. I could pack my bike quickly and securely. Moving the bag around was easy with the large rear wheels and plenty of handles for purchase points. I obviously didn't want to test the level of protection too far but I felt confident in it. The plastic rods that provide structure to the bag, such that it holds shape without a bike in it. The instructions perhaps could have been a little more comprehensive. YouTube videos are probably the way to go here. Reviews like this are really, really useful - thank you. A lot of the time I think we're very willing to do the research and to spend masses of money on the bike and the obvious bits of exciting kit and to neglect the research and skimp when choosing the less glamourous items. Sure, £300 is a lot for a bike bag. But it's great to have a sensible and detailed review explaining why it might be worthwhile. 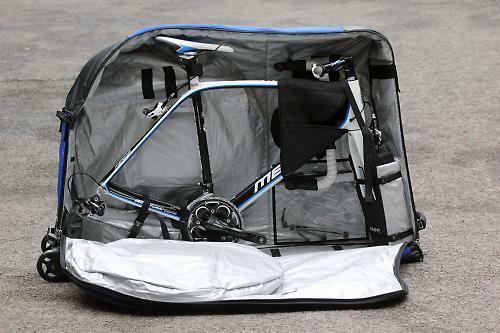 I'm now seriously considering investing in one of these before next summer's riding trips. More reviews of ostensibly boring bits of kit please road.cc! I can't vouch for the road-bike adapter, since I've only used this bag for my MTB, but I can solidly recommend it. It is a superb bag - way, way better than the cheap floppy DHB thing I had before. Stellar build quality, easy to pack and completely stable. Best bit of bike related kit I have ever bought, period. I borrowed one of these to go to the Alps this Summer - it's a really good piece of kit. The road bike adapter means the forks are very well protected. There are myriad internal ties to secure the frame and handlebars, and it packs very neatly. I have a ~£3500 bike, so £300 for a bag is a very wise investment, given the 'care' the Squeezy-Jet luggage 'technicians' display when loading the plane. Highly recommended. And I like the new colour too. Got one of these and used it a few times now - agree with everything written. used hard cases in the past, Polaris etc, and none come close as a package. I think this is a great bag but I'm not so sold on it for air travel. The best advice I've seen regarding flying with your bike is to imagine your bike bag falling 10 metres off a conveyor and then having another 23kg bag fall on top of it, then being placed on the bottom of the cargo hold (because it's big and flat) with all the other bags piled on top. Soft-side bags are fine for train travel, or to keep everything tidy in a van, but try this - next time you pack up your bike, flip the bag on its side and then stand on it. Feel comfy jumping up and down a bit? I didn't think so. I went with one of the "pod" style "semi-hard" cases. The wheels attach with skewers and have a shaped section to hold them. The frame straps in (tie knots after tightening as the buckles will let the frame sag with all the vibrations of travel). Foam pipe lagging protects the pressure points and all your soft riding kit makes great padding in the otherwise empty spots.